Here is Honey – a wild European hedgehog in my rescue centre – having hydrotherapy. When Honey arrived with me two weeks ago she would not eat and could hardly walk. She was pulling herself along with her front legs with her nose touching the ground. The x-rays show nothing obviously wrong but it looks as if the muscles in her front legs could be weak. She walks with an odd gait with her front legs. She is receiving hydrotherapy to help build up the muscle strength. She swims in a bath of warm water. She can just touch the bottom of the bath, which helps to stop her getting too stressed. She is only in the bath for a brief period as she is weak and can quickly tire with the exercise. She has already improved with her walking after only 5 hydrotherapy sessions. Hedgehogs are actually great swimmers and can cross ponds and even rivers. However, like humans they cannot swim forever. Many hedgehogs drown in garden ponds if they cannot easily find an escape route and get tired. Please make sure you provide easy escape routes from all garden ponds – there need to be many escape options. If there is only one escape option, they won’t necessarily find it. Honey will carry on with the hydrotherapy until hopefully she improves in her walking. UPDATE: Honey eventually made a good recovery and was released back to the wild. I run a hedgehog hospital in York. My work is entirely self-funded. 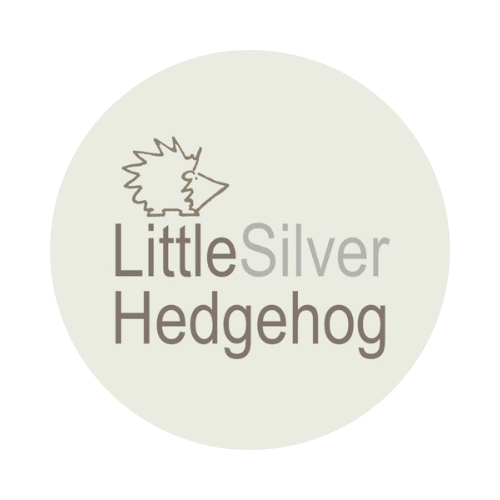 You can support my work by perusing my handmade silver jewellery or making a donation. You can also read more about my hedgehog rescue work here.